This study has an independent structured evaluation of the results of the UNHCR’s SPWS (Strategic Plan in Water and Sanitation) Chad 08-10 in terms of relevance, impact, effectiveness, efficiency and, if appropriate, sustainability – and the way these results have been achieved. Although the evaluation focus on the period concerned by the SPWS (2008-2010), it takes into consideration the preceding period, starting with the emergency and up to the development of the SPWS, i.e 2003-2007. The evaluation contains conclusions and recommendations both at strategy and operational level. An analysis of the strategy and methodology used in the elaboration of the SPWS Chad 08-10. An analysis of the actions implemented under SPWS Chad 08-10 with regards to other actions funded or carried out by others actors (Ministry of Water, Development actors, NGOs, UNICEF etc), taking into account the UNHCR mandate and modus operandi; including an analysis of future strategy which should include contingency planning. A drawing up of “lessons learned” in the context of this evaluation, including the level of investment of UNHCR since the start of the operation in terms of financial and human resources. 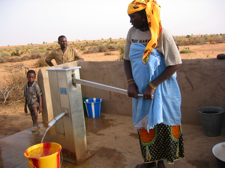 To draw conclusions and make operational recommendations for improvement and development of a new strategy concerning durable project solutions regarding drinkable water systems and sanitation facilities.